Beat the winter blues with these luxe buys. The Lotus motif is the inspiration for Ladies Premier Lotus, the brand new beauty from Harry Winston. 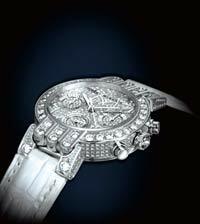 Crafted in white gold, the watch comes with an alligator strap and the 32 mm case is set in 271 diamonds. ‘Elisia’, the new range from Bvlgari, is all about stunning diamond neck pieces, bracelets, earrings and rings, set in white gold. The winter collection from Aigner includes double saddle bags in washed calfskin, and ‘Marina’ and ‘Menton’ bags in a variety of fabrics and colours. The dynamic sports car serves as the inspiration for these new phones from Vertu. The collection includes three new handsets that are available in shades of black, red and yellow. The Winter Collection for men, includes formal suits of jacquard wool, 3-D nylon jackets, satin shirts and denim wear. Red Delicious for men has top notes of bergamot, coffee and saffron flowers, while the fragrance for her is a delicious mix of champagne, lychee and red raspberries. The collection includes vases, candelabras, table lamps and colourful lacquerware. Get the Quantum of Solace look with these James Bond glares from Tom Ford. The FT0108 is part of the brand new collection of sunglasses from the designer and comes with the Tom Ford James Bond 007 logo.